In Harlem in 1916, blacks were just beginning to break out of the traditional jobs they had held since Emancipation. There were at least one or two black doctors on the staff at Harlem Hospital, and a few black nurses. With the size of Harlem's black population, professionals in many fields could earn a living, once they got established. Some of them, particularly young lawyers and dentists who were just starting their practice, would come down to Grand Central Station or Penn Station at night and haul baggage to supplement their income. And not only in New York: it was common in Chicago, Philadelphia, Jacksonville  wherever you had the big railway terminals. This wasn't so true for doctors, because blacks would respond more to a bellyache than they would to a toothache. In New York City, blacks had a foot in the door of Tammany Hall, the political machine that controlled city government, because black votes were just as important to Tammany leaders as white votes. The post office had a long history of hiring blacks, and some worked for the customs service, under the Department of the Treasury. If a man was earning $60 a month, he got by pretty well. But all these jobs were very few. Young boys would be more likely to admire the pimps and gamblers, because these guys would dress up sharp all the time, and always had money to spend. Even though they were living on the fringes of the law and were frequently arrested, they were heroes to a lot of boys. In the white section of Harlem, there was an area on St. Nicholas Avenue near Morningside Heights called Strivers Row, where they started letting celebrated black entertainers and professionals move in. When blacks could afford that type of residence, it meant they had arrived. Wealthy white people often hired black musicians to play for their affairs, because not only were the blacks very capable, but they played like they enjoyed what they were doing. And blacks always wanted to excel one another in being the best. The whites had to write the score down, but blacks could improvise, and the way they played depended on how they felt on that occasion. When they performed for black dances, they played a little bit differently. I remember years later in San Francisco, when I ran into a friend who played trombone in the house orchestra at a big hotel, and I asked him, "Why don't they ever bring Ellington in, or any of those guys?" He said, "Tom, the white folks don't know how to dance to that music." I was too young to be going to any of the Harlem nightclubs, but I heard about them. They had a floor show every night, with a big band, comedians, vocalists, and a chorus line of about six girls. Nightclubs became even more popular  and a lot more profitable  starting in 1920, when Prohibition came in. I had left Harlem by then, so I never got to see the most famous nightclub in New York, the Cotton Club, which opened on 142nd Street in 1923. Only the top black dancers and singers performed there. The chorus girls were beautiful and shapely, and most of them were very fair  none as dark as me. Lena Horne started as a chorus girl. The Cotton Club's owners were members of the Mafia, and they decided they didn't want black customers in there, because they wanted to entice big white money. A lot of white people would come uptown "slumming," because they knew that nobody could play jazz music, or could dance, like blacks did. When I lived in Harlem, the best-known black woman there was Madam C.J. Walker. She developed a new method of straightening hair, using heated metal combs and some kind of oily substance, and she became a millionaire. She also sold a facial cream that would lighten the skin. I never saw her, but I talked with people who had contact with her. She had a townhouse and beauty school on 136th Street, and a $200,000 mansion on the Hudson. Every black woman in the United States knew who Madam Walker was, unless they lived down in the swamps of Mississippi or someplace like that. And they probably heard about her there too, because her process went out all over the country. Women started opening up beauty parlors, and they used her products. The compelling drive behind her success was that black people wanted to look white. 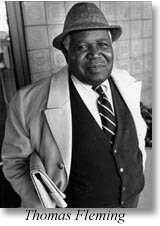 About a decade later, a black journalist in Harlem, George Schuyler, wrote a hilarious book on the subject called "Black No More." It was a satire about blacks trying to find all sorts of means to make their pigmentation disappear. It told about a guy who discovered a cream that could turn black people white, and showed all the confusion that would result. Some blacks would read it and roll with laughter. Some of them didn't like it; they were sensitive about it. But I thought it was funny as hell.